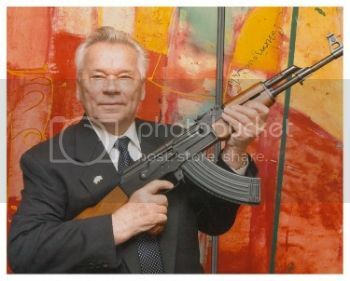 This picture is a snapshot of Mikhail Kalashnikov, inventor of the AK-47 Rifle. He died yesterday at the age of 94. Of his famous invention he said, "When a young man, I read somewhere the following: God the Almighty said, 'All that is too complex is unnecessary, and it is simple that is needed' ... So this has been my lifetime motto – I have been creating weapons to defend the borders of my fatherland, to be simple and reliable."